Keeping my kids safe and healthy is my number 1 priority. Both of my kids love to be outside playing, running, swimming, riding bikes, drawing with chalk, playing in the dirt….we spend a LOT of time outside. I want to make sure that I am protecting their skin from the sun. Sunburn and sun damage is something I don’t want to mess around with. There are so many options when it comes to sunscreen. This summer especially I have been more aware of the random and toxic chemicals that are in sunscreen. I was on the hunt for a non-toxic sunscreen that would keep my kids safe and protect their sensitive skin from the sun without any harsh chemicals. Babyganics has a line of organic, eco-friendly, non-toxic baby-safe personal care and home products. They have a great selection of sunscreen that I was so excited to try. We received a tube of mineral based sunscreen in SPF+50 and also SPF30, as well as some single use tubes in SPF+50. 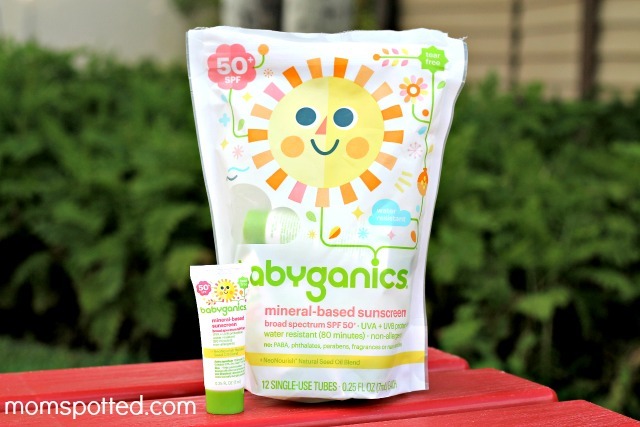 Just from reading the tubes I knew babyganics mineral based sunscreen met a lot of my sunscreen requirements. They have NO PABA, phthalates, parabens, fragrances or nano-particles. Not only does it off great sun protection but it contains 100% natural NeoNourish® Seed Oil Blend to help nurture and support skin. It has broad spectrum UVA/UVB protection. It is water-resistant, tear free, and non-allergenic. Babyganics sunscreen is also pediatrician and dermatologist tested. I was a little worried that the sunscreen would go on chalky, or be to thick and not rub in. My kids know that before we go outside sunscreen is ALWAYS part of our routine, but it doesn’t make them hate it any less. There is usually always crying, especially when I am rubbing it on their faces. Hayden always complains that it takes to long, and Halli is squirming to get away. BUT with Babyganics mineral sunscreen I was pleasantly surprised when it rubbed in like a dream! I only needed a little bit to cover all of Halli’s body, and it rubbed in really quickly. Even though it says “Baby”-ganics I wanted to use it on Hayden as well to give him some chemical free sun protection. It was so quick and painless to apply it to both of them, and Hayden mentioned he liked that it “didn’t smell gross like mommy’s hair spray.” It also didn’t leave any greasy film or residue. I have used both the SPF50+ for when we are swimming, and also the SPF30 for quick trips to the park. Both apply easily and offer excellent sun protection. We haven’t had a sunburn yet! I also LOVE the single use tubes. I always keep 2 or 3 of the tubes in my diaper bag and pulled them out when I need them. I have also used Babyganics mineral sunscreen on me and it gives me great sun protection as well. 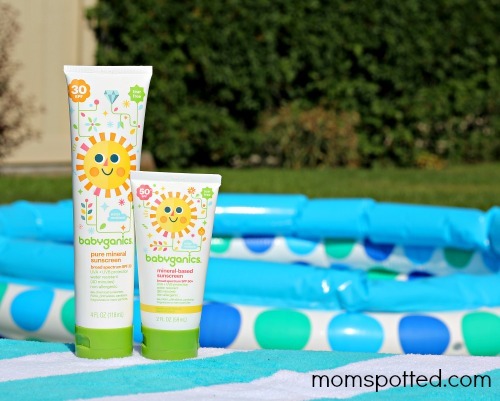 Babyganics sunscreen is great sunscreen for my entire family. You can purchase Babyganics mineral sunscreen at Babies R’ Us, Amazon, Target, Walgreens, and other local retailers.